Grimoin-Sanson’s Cineorama fuzes two media technologies to create a new experience: immersive cinema. The media-art-form of the early 19th century, invented by Louis-Jacques Mande Daguerre, the diorama – a circular building in which was hung a 360-degree painted canvas depicting views, great battles, etc – is combined with a very modern and recent 19th century invention, the cinematograph, in a bravado tour de force of new media experimentation worthy of the Paris World Exposition of 1900. Grimoin-Sanson’s 10-camera panoroamic camera rig for shooting content for his Cineorama of 1900. 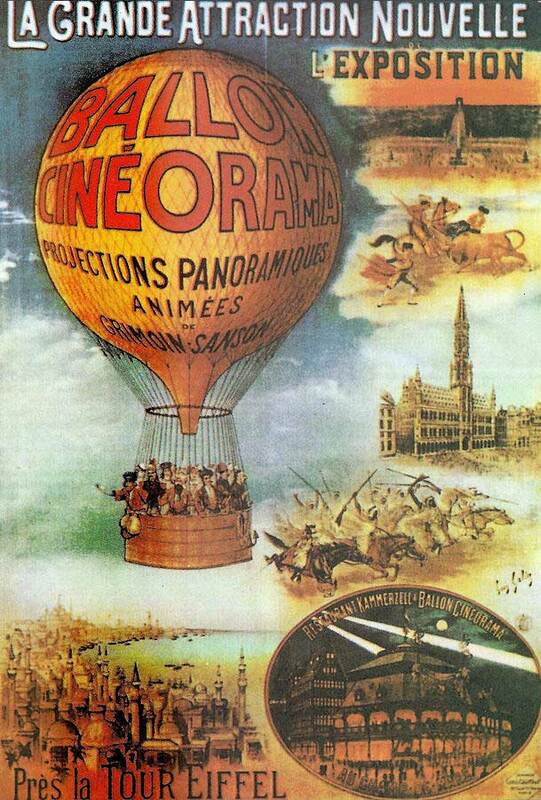 Using synchronised cameras with slightly overlapping frame coverage of the entire 360-degree scene from an ascending balloon over Paris, Grimoin-Sanson then projects these linked films to create a simulated balloon ride for visitors to the Expo. It is entirely appropriate that the new 20th century should be celebrated by a marriage of old and new media, and of course that the content of this new marriage should be the experience of flight. 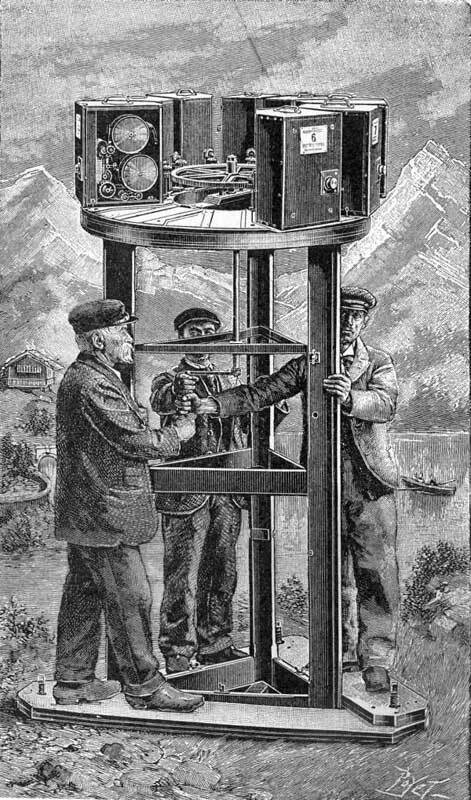 So three years before the first powered aeroplane flight, Raoul Grimoin-Sanson celebrates the experience of flying in this stimulation of a balloon-flight over Paris. Filmed using a set of synchronised 70 mm movie cameras, projected using a similarly synchronised set of 10 projectors, Cineorama provided the first taste of 20th century immersive entertainment. Poster for the Cineorama – a foretaste of theme-park rides and subsequent world expo installations, Cineorama begins a long strand of innovation exploring immersive experience and simulation that culminates with the invention of virtual reality and augmented reality, iMax theatres and immersive-art installations towards the end of the century.